After eyeing it for a while, I finally caved and purchased an iSi Whipped Cream Dispenser. This is a heavy-duty piece of equipment, and I am very satisfied with the quality. If you’ve been around the internet for a while, or if you have visited a snooty restaurant with thirty tiny courses made out of science, you are familiar with the molecular gastronomy/mixology practice of making flavored foams. I’d been dying to try it and now, at last, I have. For my first foam, I wanted to go by the book, so I watched this video by Jamie Boudreau and followed his advice closely. 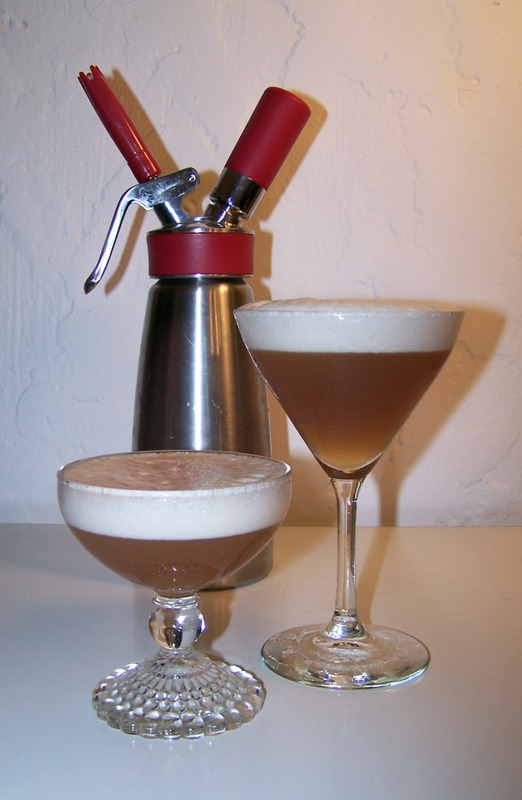 His drink sounded interesting, but I still wanted to go my own way, so I decided to take two recipes that I already know and love, and put them together. The combination was kind of disappointing, but the foam itself was delicious, and overall a huge success. In the video, Jamie mentions that gomme syrup in the underlying drink is important to help its texture stand up to the rich foam. I heard this advice, but I did not have any gomme syrup, so I charged ahead blithely without it, with predictable results. It wasn’t so much a problem of the viscosity of the drink, in my opinion, as a problem with the flavor. The foam was loosely inspired by my Vanilla Whiskey Fix, except I changed the balance to match Mr. Boudreau’s specifications. For the underlying drink, I used this apple brandy concoction. When I tasted the foam on its own, prior to mixing the drink, it felt like a good match in my imagination, but the flavor of the foam was very powerful, so that all you could taste from the underlying drink was the allspice. Place all in a whipped cream dispenser, seal, and shake. Discharge a nitrogen cartridge into the dispenser and then place the dispenser in the fridge for an hour to allow the foam to emulsify. If you need foam RIGHT THIS SECOND, discharge two nitrogen cartridges and wait a few minutes. The foam came out of the dispenser with a very rich, creamy texture, similar to the head on draft Guinness or Boddingtons, but thicker. It completely destroyed the aroma of the underlying drink, so that was a disappointment, but I think the real artistry here lies in finding flavors that are distinct and yet complementary, or perhaps in using a lighter foam. The only real hitch here was the stability of the foam. It broke down before I could finish the drink, most likely because I needed more sugar relative to the acidity of the lemon juice. Still, I don’t think anyone would complain if I served this foam to them at a party. Before I go, a quick meditation on capacity. The above recipe made just enough foam for three drinks, and I think the 1 pint canister that I purchased could accommodate roughly double that, or six drinks. If you need to make these in a larger quantity than that, you should probably get the quart. I slightly regret not doing so. Coming soon: Flash infusions. Categories: barware, modern drinks | Tags: alcohol, allspice, bitters, booze, chemistry, cocktail, cocktail foam, cocktails, drinking, drinks, foam, honey, lemon, mixology, molecular, molecular mixology, vanilla, whipped cream, whiskey, whiskey sour | Permalink. This looks perfect! Did the lemon juice successfully overpower the taste of egg whites? Fresh egg whites have no odor or flavor, they only contribute texture to the drink. Eggs that are too old may have unpleasant aromas, and should not be used in a drink.